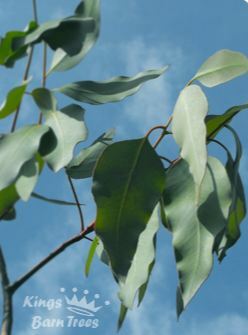 There are around 894 different species of Eucalyptus worldwide, they originate from Australia and Tasmania where they grow in many different environments ranging from deserts to swamps to mountain sides. To grow them in the UK it's necessary to select those species which grow in similar conditions on the other side of the world. Our selection includes species that have been found to be more hardy and well suited to a temperate climate. We grow all of our trees from seed on site in Sussex. We offer smaller Planting Stock sizes (usually 20cm-70m tall) along with more mature trees up to 210cm tall. See our Tree Size Guide for more info. 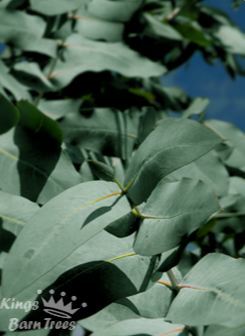 Eucalyptus trees can be used for a wide variety of uses including: Screening and Hedging, Ornamental and Specimen planting and for Floristry. 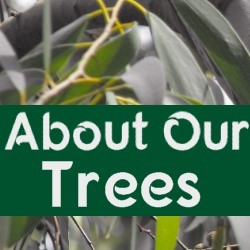 The following section will give you an insight into how we grow our Eucalyptus trees for long term survivability and customer satisfaction. We only buy seed from reputible suppliers in Australia or New Zealand who are also able to certify the provenance, or source, of the seed as a result we know what environment the tree is capable of surviving in and hence have a good idea of it's hardiness. This is not an exact science and as a result it's best to err on the side of caution. 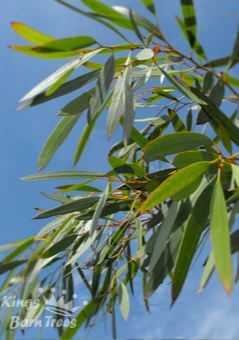 Having said that, Eucalyptus trees have been grown in the UK for many years and have survived many a harsh winter and by continuing to use hardy species we improve their chances of success. Indeed, meteorological data is showing that the UK's winters are getting warmer which will incease survivability. The seed is kept in a controlled environment before it's used. The seed is stratified where necessary and then sown into seed trays for germination. We are careful to select the healthiest seedlings for potting and time the potting so that the seedling is at just the right stage. Most of the seedlings are planted in special propagation trays designed to produce a healthy root structure. These are an ideal size for Eucalyptus producing a balanced plant ready for planting out, hence we call them planting stock. This planting stock is grown in large cells which, because of their design, produce a good root structure that does not spiral. When sold, the young trees are removed from these cells and packaged to prevent damage to the roots and water loss. Unlike bare rooted trees, our cell grown trees are supplied with the roots still contained within their original growing media. This maintains the root structure and protects the roots from damage. The structure of the roots is such that when planted, the roots rapidly root into the surrounding soil. 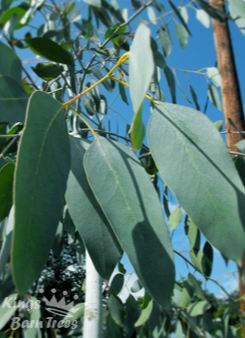 A number of seedlings are planted directly into Air-Pots to produce larger Eucalyptus trees. 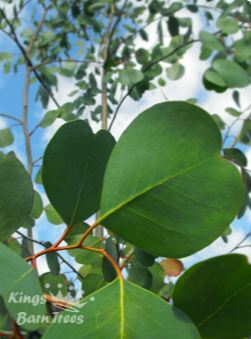 Instead of conventional pots, we use www.eucalyptus-trees.co.uk containers, which are specially designed to control and contain vigorous roots. Using Air-Pots we are able to produce well balanced larger Eucalyptus trees which will establish properly when planted out. Ordinary plastic pots are totally unsuitable for Eucalyptus trees whatever size they are. 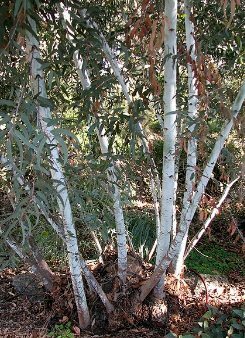 We would strongly advise against buying a Eucalyptus tree grown in a conventional pot as it's more than likely to be root bound with coiled roots. We could almost guarantee that such a tree will not establish quickly, if at all, and it's unlikely to be wind fast.